A few months back Nate and I decided to switch out our faucet in our guest bathroom. Mainly because every time we turned it on it sprayed EVERYWHERE other than into the sink and on your hands. There was usually a lot of cussing and soaking up water after forgetting to not turn the faucet on full power. To fix it we shut off the cold water valve, which lessened the power to the faucet but also meant that you got some hot water right quick. So after a few too many oops, I did some research and found that changing a faucet is actually fairly easy. Nate took apart the old faucet and gave it to me and then I gleefully skipped off to Home Depot (would have rather it been Lowes). The gleefulness stopped as soon as I got to the bath aisle. Lets just say there was a lot to choose from and not a damn person to help me. When I did find someone, they were less than chipper. Thanks man! I ended up falling in love with one, but I thought it might be too "much" theme for the bathroom. I went with another one and brought it home. Nate decided he wanted to see the other faucet that I loved, so back to HD we went. Of course we ended up returning the one we got and purchased the one I loved. Nate then set to work. I think it took him a total of 4 hours to do (he also had a new towel rack, shower head to install, as well as spacers to add to the toilet). It was probably one of the easiest ways for us to change the look of our bathroom and not have to hit the deck every time you turned the damn thing on. This is what we started out with. It looks so simple and unassuming. Then you turned it on. This is what I first came home with (and what our towel rack matches). I liked the long neck a lot. There is nothing I hate more then when the actual faucet is too close to the back of the sink, so you're bumping your hands around trying to get them wet. This is what we ended up with (though not as tall). Our bathroom has a bamboo theme to it (our shower curtain and a few accessories have the look). I also LOVE the way the water softly flows out of it. Here it is actually installed in our bathroom. I don't feel that it is over powering or in your face. From the side with the water running. I love the knob on the top, it makes it easier to turn it on and off if your hands are messy. From the front with water on. 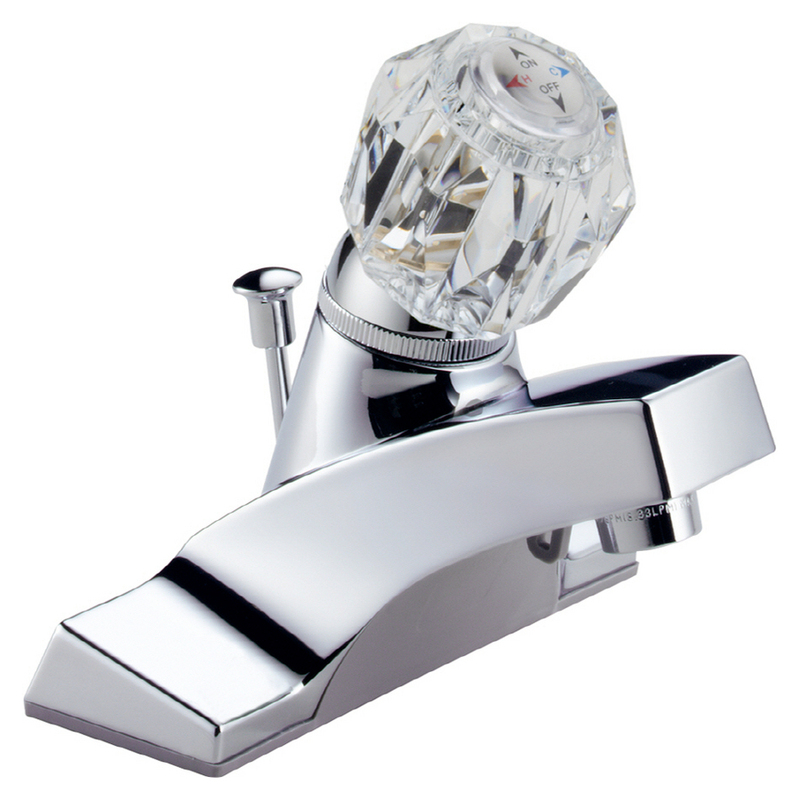 If you're thinking about replacing a faucet in a bathroom, I would recommend it. It's not as easy as switching out a shower head, but it's easy enough that you don't need to pay someone to come in to do it for you.